Let’s start with a short pre-blog quiz: which of these native insects pollinate plants? The answer? #4. If you left out flies and wasps because they freak you out … well, just know there’s scads of different wasps and flies — not to mention bees, moths, and beetles — that’ll pollinate your posies, not to mention your apples and pears, your melons and cukes. Male carpenter bees seem to help protects nests. Get too close and they’ll act aggressive — even though they don’t have stingers. Females could sting but won’t unless you start handling them. 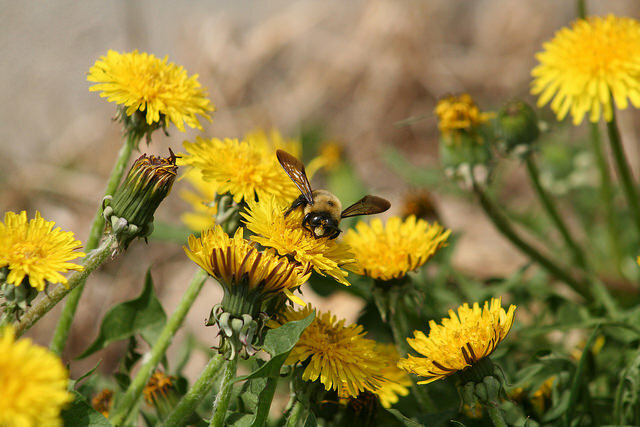 Let’s look at bees first — native bees! Because the natives outnumber honey bees (originally imported from Europe) in apple orchards. A NYS IPM-funded study from 2009 – 2011 found 102 species of native bees busily pollinating apple flowers — and Cornell’s Bryan Danforth, who led that study, estimates that the native bees outperform honeybees by 200 to 300 percent. Yes, honeybees have a value-added bonus: honey rang the registers in New York at over $10 million in 2015. But if apples or pears (or blueberries or strawberries) are your crop of concern, look to the natives. Think fruit growers are the only ones to benefit? 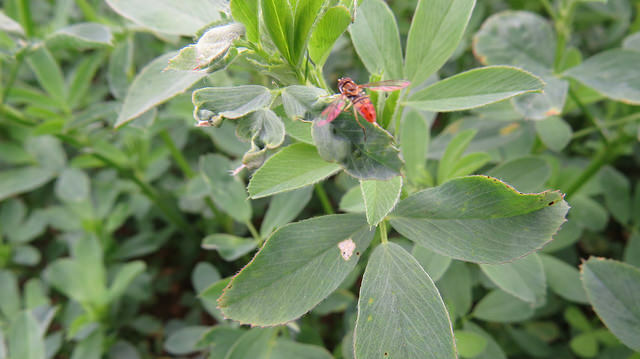 Dairy farmers take note — leaf-cutter bees pollinate your alfalfa, according to Cornell’s Emma Mullen at NYS IPM’s pollinator conference in 2015. And while many vegetable crops are wind- or gravity-pollinated, key crops like melons, squash, pumpkins and cukes need a pollinators’ help. Syrphid flies? Harmless. This one’s looking for a flower to pollinate. So … what about flies? More than meets the eye. Finding New York-specific info is a struggle, so let’s just note that vast numbers of fly species all over the world make their living off nectar. Spreading pollen around is a sideline for them but critical for us. In fact, ecologist Alison Parker (University of Toronto) modeled how bees and flies visit flowers — and showed that lots of bees might not always benefit the flowers because bees take so much pollen. But in this computer model, pollination increased with each fly visit. Not only that, but with some (perhaps many), their larvae serve as biocontrols for crop-damaging aphids. Most nectar-guzzling flies resemble bees or wasps — after all, if you’re harmless but you look like something that defends yourself with a stinger, you’re more likely to be left alone. What about beetles, moths, butterflies? Beetles were the very first insect pollinators, with ancient evolutionary origins — and according to the US Forest Service, a global pollination rate of 88 percent. The butterflies and moths? Ranking their value is a tough call, but hey — they have a job; they show up. Actually, those second-shift moths way outnumber day-duty butterflies. But you don’t often see them at work, so we don’t know how much good they do, especially since sometimes their larvae can be troublesome for certain plants. How about wasps? If you’ve done enough noodling around online to see that wasps do little in the way of pollination because their bodies are hairless, unable to capture and carry much pollen, keep looking. No, they’re not as competent as bees. But many do have hairy bodies, and they do help. Plus they’re great garden predators, tackling all sorts of pests. Bringing it all together, a NYS IPM-funded project now underway at the State University of New York at Cobleskill will evaluate the efficacy of different native plant combinations in attracting native pollinators of every stripe and color — and invite visitors to view the farm and orchard demonstration plots to learn more. What to worry about? Well, yes, the big bruisers in the pollination game often have stingers, and we don’t like being stung — but that’s for another post. And of course there’s the issue of bee health and bee declines — again, for another post. No, there’s a couple of somethings that over time could take a toll on any number of critters and plants, and we’re just beginning to wrap our arms around them. 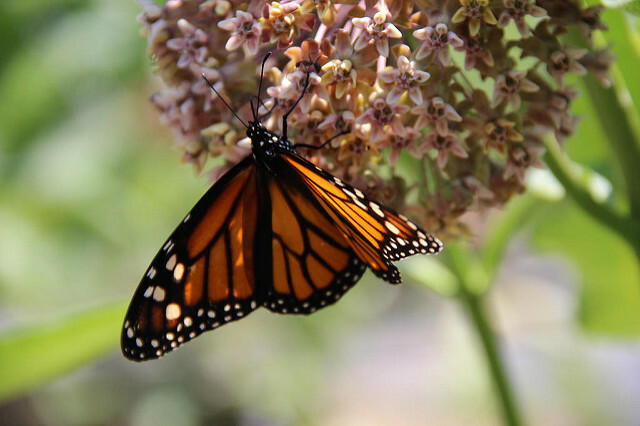 One: the impact that changing climates could have on pollinators. Not that we understand the dynamics well. The other: lost and fragmented habitats. If you go back to Emma Mullen’s slides, you’ll see that bumble bees, for one, are unable to track climate change. And they are not alone. You’ll also find references for habitat loss and fragmentation and if you’re so inclined, you can watch the video of her talk. More than enough info for now, no? Stay tuned — this is a perennial topic.